Join Allan Badiner, Alex Grey, and Allyson Grey at CoSM: the Chapel of Sacred Mirrors on November 21st for an in depth, interdimensional , intersectional discussion exploring the promise of DMT, the path of the Dharma, and how to act creatively and skillfully with whatever tunes us in. Buddhism and psychedelic exploration share a common concern: the liberation of the mind. This new edition of Zig Zag Zen: Buddhism and Psychedelics (2015, Synergetic Press) has evolved from the landmark anthology that launched the first inquiry into the ethical, doctrinal, and transcendental considerations at the intersection of Buddhism and psychedelics. A provocative and thoughtful exploration of inner states and personal transformation, Zig Zag Zen now contains an expanded display of remarkable artwork including pieces from Android Jones, Sukhi Barber, Ang Tsherin Sherpa, and Amanda Sage, as well as the original work of Robert Venosa, Mark Rothko, Robert Beer, Francesco Clemente, and many others, including more work by the pioneering visionary artist Alex Grey. Allan Badiner served as the editor in the first and second editions of Zig Zag Zen: Buddhism and Psychedelics (Chronicle Books, 2002; Synergetic Press, 2015), as well as two other books of collected essays, Dharma Gaia: A Harvest in Buddhism and Ecology and Mindfulness in the Marketplace: Compassionate Responses to Consumerism. Allan is a contributing editor of Tricycle magazine, and serves on the board of directors of Rainforest Action Network, Threshold Foundation and Project CBD. He has been a student of Zen Master Thich Nhat Hanh for more than 25 years. 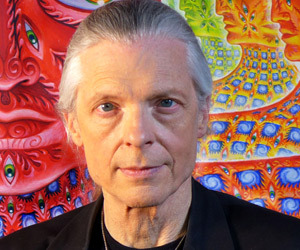 Alex Grey is a renowned American visionary artist specializing in spiritual and psychedelic art. His work spans a variety of forms including performance art, sculpture and painting. He is a member of the Integral Institute, on the board of advisors for the Center for Cognitive Liberty and Ethics and is Chair of Wisdom University’s Sacred Art Department. He and his wife Allyson Grey are co-founders of the Chapel of Sacred Mirrors (CoSM), a non-profit church supporting Visionary Culture in Wappinger, New York. Allyson Grey artist, writer & social sculptor, has co-written & edited a dozen books & all seven volumes of CoSM Journal of Visionary Culture. Since 1975, Allyson has been artistic partner and studio mate of artist, Alex Grey. With a Master of Fine Arts from Tufts University, Allyson has been an educator & muse to artists the world over. Alex & Allyson are the parents of actress, Zena Grey. Together, they co-founded the Chapel of Sacred Mirrors, CoSM, an interfaith church, celebrating creativity as a spiritual path. Even if you aren’t able to attend the event, you can still engage in the conversation with the many voices of Zig Zag Zen: Buddhism and Psychedelics.